Sheldon, W.M. Jr., Moran, M.A. and Hollibaugh, J.T. 2002. Efforts to link ecological metadata with bacterial gene sequences at the Sapelo Island Microbial Observatory. Pages 402-407 in: Proceedings of the 6th World Multiconference on Systemics, Cybernetics, and Informatics: Information Systems Development II. International Institute of Informatics and Systemics, Orlando, Florida. Henshaw, D.L., Sheldon, W.M. Jr., Remillard, S.M. and Kotwica, K. 2006. ClimDB/HydroDB: A web harvester and data warehouse approach to building a cross-site climate and hydrology database. In: Proceedings of the 7th International Conference on Hydroscience and Engineering (ICHE 2006). Michael Piasecki and College of Engineering, Drexel University, Philadelphia, USA. Sheldon, W.M. Jr. 2008. Dynamic, Rule-based Quality Control Framework for Real-time Sensor Data. Pages 145-150 in: Gries, C. and Jones, M.B. (editors). Proceedings of the Environmental Information Management Conference 2008 (EIM 2008): Sensor Networks. Albuquerque, New Mexico. Provisional SALTEx well logger monitoring data are available on the Project Data page through September 2018. The Schlumberger logger files were corrected for atmospheric pressure and sensor elevation for calculation of water level, and salinity and density were calculated from temperature and conductivity measurements. Provisional long-term sonde data sets, covering the full period of record at each GCE mooring through September 2018, are now available on the private GCE website and Long-Term Data Plots web page. Both "real-time" 30 minute interval and daily summary data sets and plots are available for each station. Finalized yearly and long-term sonde data sets through 2017 are also publicly available in the GCE Data Portal, GCE Data Catalog and LTER Data Portal. Finalized salinity, temperature and pressure data from GCE MicroCAT sonde moorings near sites GCE1, GCE2, GCE3, GCE6, GCE7, GCE8, GCE9, GCE10 and GCE11 (freshwater tidal forest site in the Altamaha River) are now available in the GCE Data Catalog and GCE Data Portal. In addition to the original 30-minute-interval data, daily-summarized data files are also available as additional downloads for all sonde data sets. More information about GCE moorings is available at http://gce-lter.marsci.uga.edu/public/research/mon/sounds_creeks.htm. The Tide Tables page on the GCE website has been updated to include links to NOAA Tides & Currents pages for each station, replacing the outdated links to pre-generated PDF files from NobelTec Tides & Currents software. The NOAA web page provides various options for choosing time zone, time format and file format, and supports generating tide predictions for two years before and after the current date for planning or comparisons. Wenwen Liu spent over a year in the Pennings lab working on manuscripts comparing Spartina alterniflora in the US and in its massive introduction into China. He also has worked up a couple wonderful manuscripts based on long-term GCE LTER plant monitoring datasets. 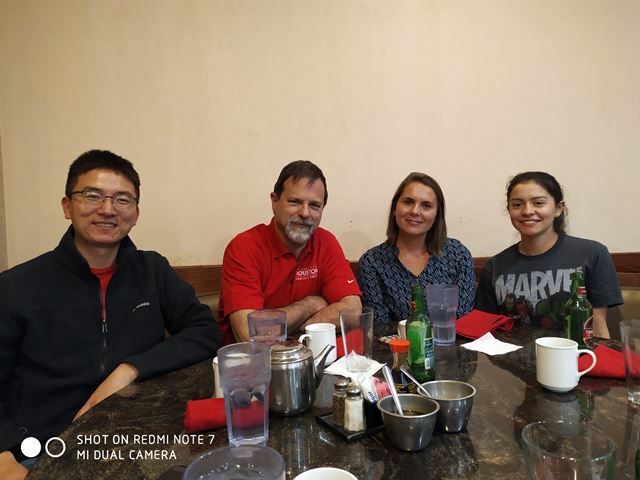 We wish him the best as he heads back to China to finish up his PhD, and we hope to get many of these manuscripts published in 2019. The new boat is ready for launch! As many of you know, the RV Fishwater began falling apart internally after a decade of roaming the coastal marshes. The Fishwater had just been repowered last year. As a result, we were able to just purchase a new hull and transfer the fairly new motor over to this new Carolina Skiff DLV hull. It should provide safe and reliable access to research sites for years to come. The Indiana University Wetlands Lab visited SALTEx in March to monitor recovery of the marsh following cessation of dosing. 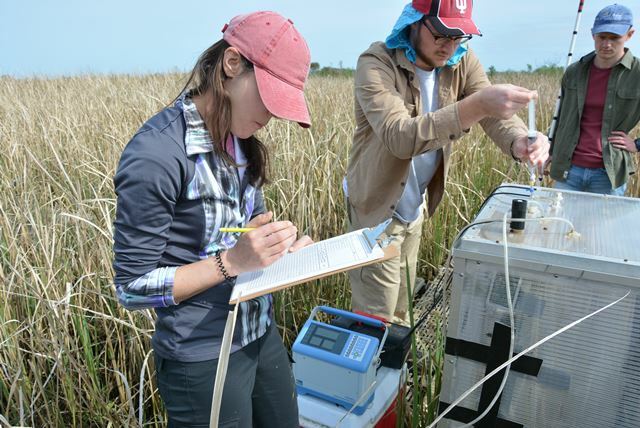 They collected porewater and measured soil redox potential and greenhouse gases. In the photo, Courtney Mobilian, Carson Hoogewerf, and Evan Monnett are measuring net ecosystem exchange and collecting methane samples from one of the plots. The tube housing the SINERR YSI EXO2 sonde installed at Marsh Landing on Sapelo was broken again on Mar 5, 2019, and the instrument stopped relaying data. SINERR is aware of the problem and is working to restore service at the site. Note that the near-real-time data plot from the station has been removed from the GCE home page until data telemetry resumes.